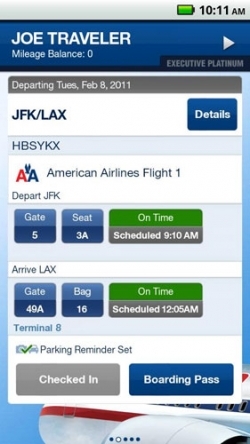 American Airlines launches Android app | Android Blast! American Airlines has launched their app for Android. They've had an iPhone app for quite awhile now, and they finally released a comparable version for Android. The app does what you would expect out of an airline app. It allows the user to check in for flights, have an electronic boarding pass, receive gate and seat information, and flight status details. It has maps of terminals, information on the Admirals Club, and more. It even has a Sudoku game for those times when you're bumped from a flight and need to kill time. I fly American quite a bit and have used the iPhone app to handle my electronic boarding pass. It's slick. Give it a try in the Market or at the link below.